Our place is located 10 minutes driving distance from La Fortuna where you’ll find good restaurants and dining. You’ll love my place because of the outdoors, the comfy beds, the ambiance with beautiful gardens and a fresh water creek flowing through our property. Our guests and service is focused towards our guests, usually couples, adventurers, business travelers, big groups, families with kids and furry friends. I was born in Arenal Area, I am very proud of my amazing country, I love share our nature with people from all the word... I love nature, animals , my job I really enjoy meet the beautiful that visit us . This property was built thinking in our guests. for 4 Villas guests use. Every other day house cleaning. My family and I just returned from a fabulous stay at Unit #4. I can not say enough good things about our stay. The unit itself is nicely updated, with plenty of room for a family of 4. The living areas do not have air conditioning, but there is enough of a cool breeze at night and in the morning, that we were completely comfortable. The bedrooms do have air. The landscaping at the property is so lush and beautiful. There is a quiet stream that runs at the back of the property,and the pool is a nice bonus. 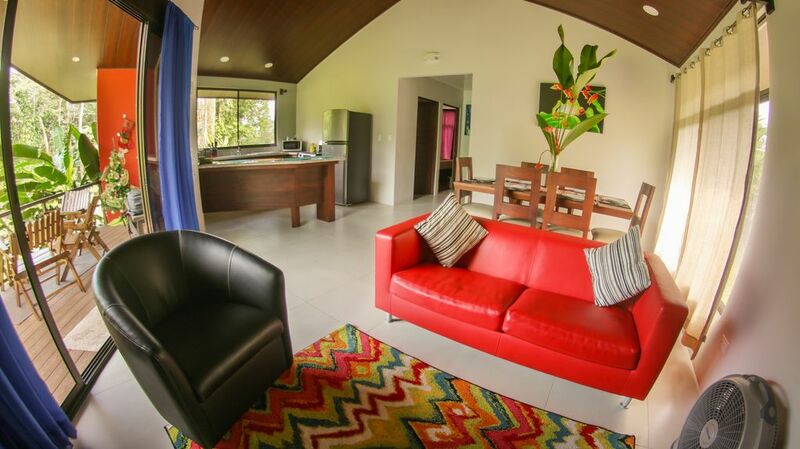 The property itself is about 10 minutes to La Fortuna. It is so nice and peaceful that it is worth the extra drive to town. We drove from San Jose. We had no trouble with Waze guiding the way. I will second the earlier review, that it was much easier to enter the name of the restaurant "El Gran Abuelo" and the road to the property is right beside the restaurant. The road to the villa is a gravel road, so be prepared for a short bumpy ride. However, before the end of our stay, a fresh load of gravel was placed on the road, and it was a much smoother ride. Max was fabulous. He met us at arrival, and gave us the lay of the land so to speak. We took his advice and booked an ATV excursion, and we were so pleased. We highly reccommend a stay here and hope to return soon. Great property in a quiet area away from the hustle and bustle of La Fortuna but still a short deive away. Gorgeous setting, clean and quiet. We stayed in the last villa on the property - most private, and great for couples. If you have kids pick the one near the pool. Max was super helpful, all the activities he set up for us were great. Everything you need to cook supplied. The villa is several miles out of town, so quiet with a great back yard. Hi Dorothy thank you for your stayed in our place . I am glad that you enjoyed there , our place is located 6 miles (10 minutes driving) from La Fortuna Down Town, that is the reason that we can offer secure and relaxing place without any noise and traffic ! The grounds are beautiful and the villas are very well appointed. I would highly recommend this place for its serenity and beauty. Max was a great host and very accomodating. He was a great asset to the whole Casa Bukala experience. We spent three nights in Unit #4. The villa is quite comfortable and easily accommodated the three of us. It has a nice kitchen and a deck overlooking a very pretty landscape. The two bedrooms are air conditioned, but the rest of the villa is not. Max welcomed us after some difficulty in locating the property. All they can give out in the form of directions is the latitude and longitude of the villa (I kid you not). Good luck entering that in your nav app and then being successful in being directed there. It's much better to enter the name of the closed restaurant "El Gran Abuelo" into Google Maps, Waze, etc. Once you get there, simply drive 1 km down a VERY bumpy gravel road, and look for the sign "Casa Bukala" on your left. The villa is about a 10 minute drive from and to La Fortuna once you traverse the 1 km gravel road which takes about an additional five minutes. You can't go much over 10 km/hr if you have a normal sedan like we did. It might be better in an SUV, but it was very uncomfortable in a standard car. Speaking of Max, he was very helpful and suggested restaurants, white water rafting and zip-line companies. We took his advice about the white water rafting company, Costa Rica Descents, in La Fortuna. They'll pick up if you're staying in a hotel, but we drove to their office and then rode with everybody in their bus to the river (about 45 minutes). We're glad we followed Max's advice because this company is terrific. The owner, Warner, is only in his mid-thirties but has already done more than most people twice his age, and he has a lot of big plans for his future. He's a great guy, and I have no doubt he'll succeed in anything he puts his mind to. All of his guides, especially Tom, are great guys, and we had a blast. All-in-all, we enjoyed our stay at the property, but the drive back and forth on the gravel road gives us pause about returning. It might not bother you as much especially if you have a big SUV.